Magnificent, Grim, Irresistible – Colonel Frank Aretas Haskell, aide-de-camp to General John Gibbon, wrote these three words in a letter describing the now famous Confederate charge at Gettysburg on July 3rd, 1863. 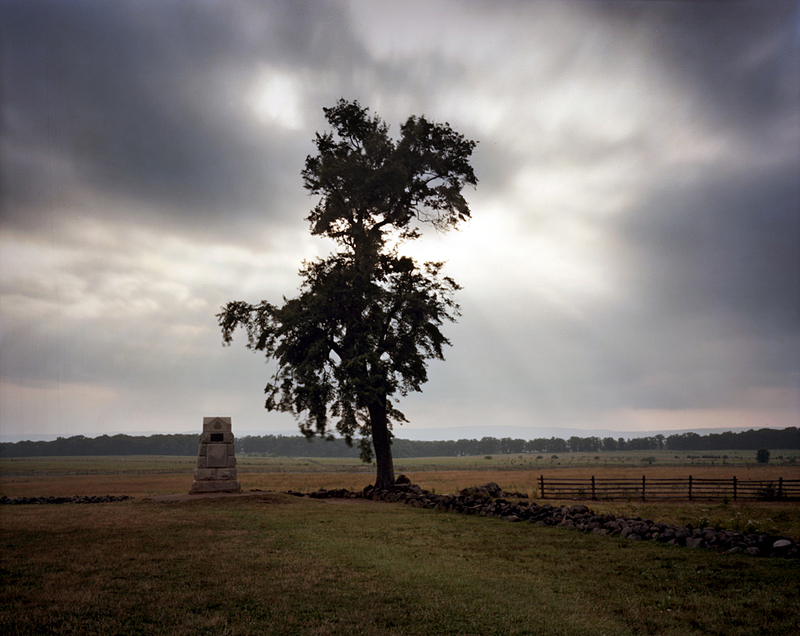 Known as Pickett’s Charge, the massive confederate attack came on the third and final day of intense fighting at the small Pennsylvania town and is infamously known as the high-water-mark of the Confederacy. Colonel Haskell posted on Cemetery Ridge with the soldiers of the Union Army’s Second Corps would feel the brunt of this massive attack and, at it’s conclusion, witness a sea-change in the war. Colonel Haskell also had a singular, unique perspective on July 3rd. After the wounding of both Generals, Gibbon and Hancock, Haskell, remained the only Union officer in the saddle during this historic charge. 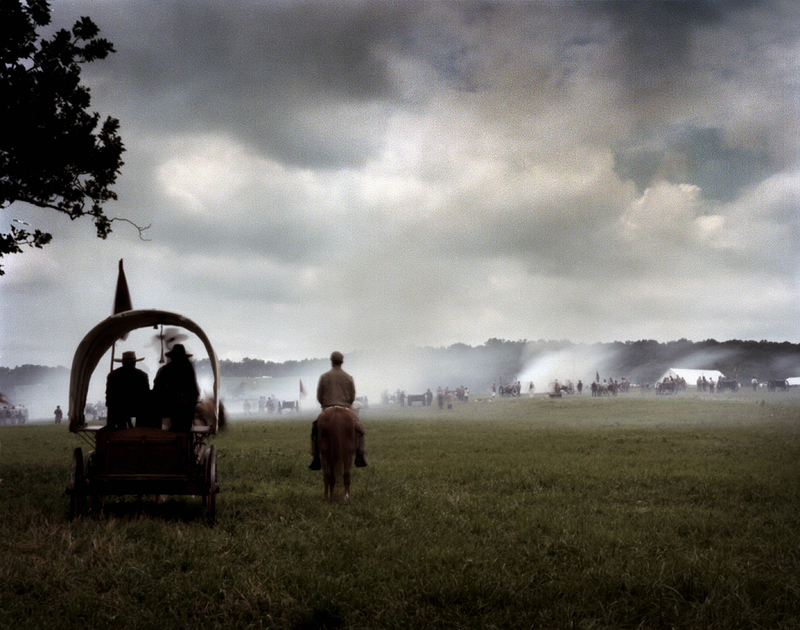 Observing the fighting from the perch of his horse, Col. Haskell had an unrivaled perspective of the confederate attack that day. Soon after the engagement Colonel Haskell recounted these events in a long letter to his brother back in Wisconsin. The letter, itself now famous, was not intended for publication and is a mixture of military tactical overview and poetic drama. The lengthy dispatch seems to serve Haskell as a kind of catharsis; written just a few days after the battle, the correspondence flows briskly with 19th century eloquence as Col. Haskell recalls the early morning fighting at Culps Hill and his experience as aide-de-camp to Gen. Gibbon, delivering and retrieving messages during the battle, being wounded and finally helping to “seal the breach” at the height of fighting. On the morning of July 3rd. 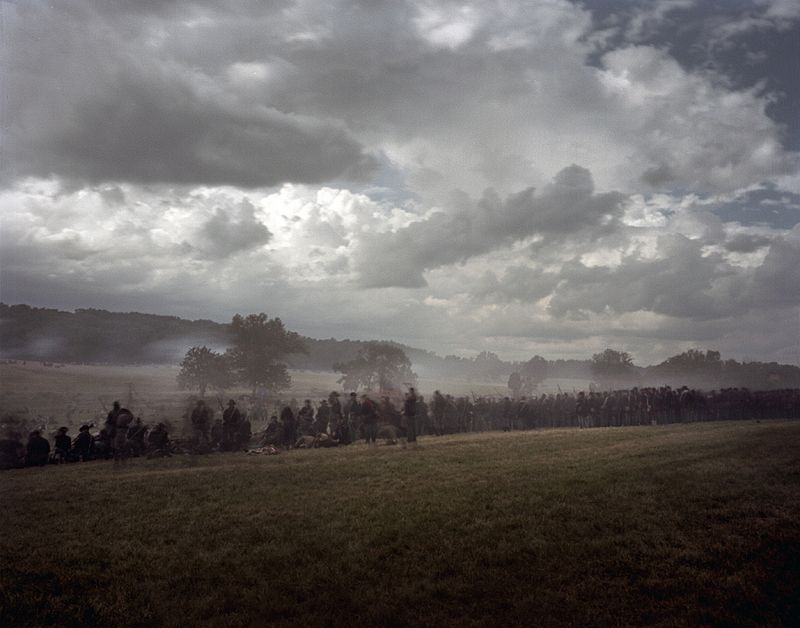 1863, the two armies stood facing each other across a mile of open ground. After attacking the Union flanks for the last two days, Gen. Robert E. Lee’s objective on July 3rd. 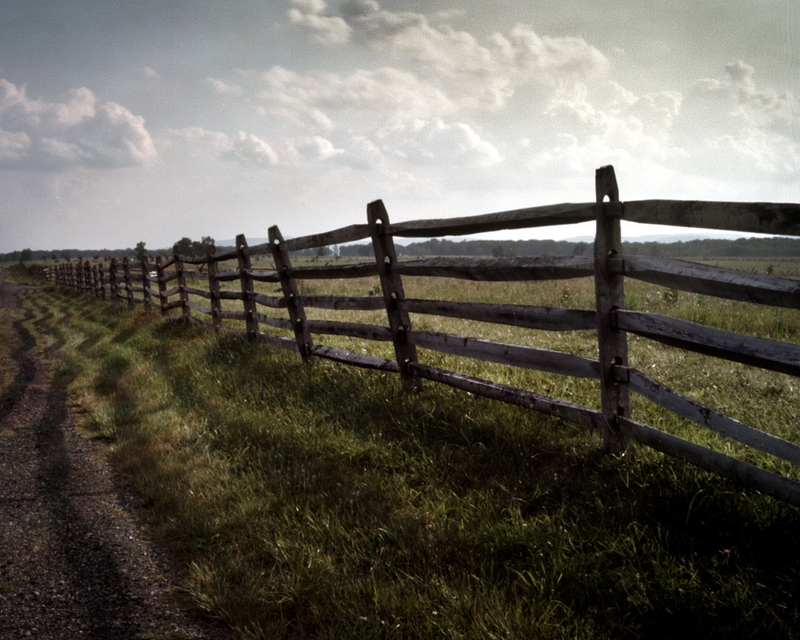 was the center of the Union position at Gettysburg. As Gen. Lee looked out from Seminary Ridge to the long slope of Cemetery Hill he saw a chance to cut the Army of the Potomac in two. 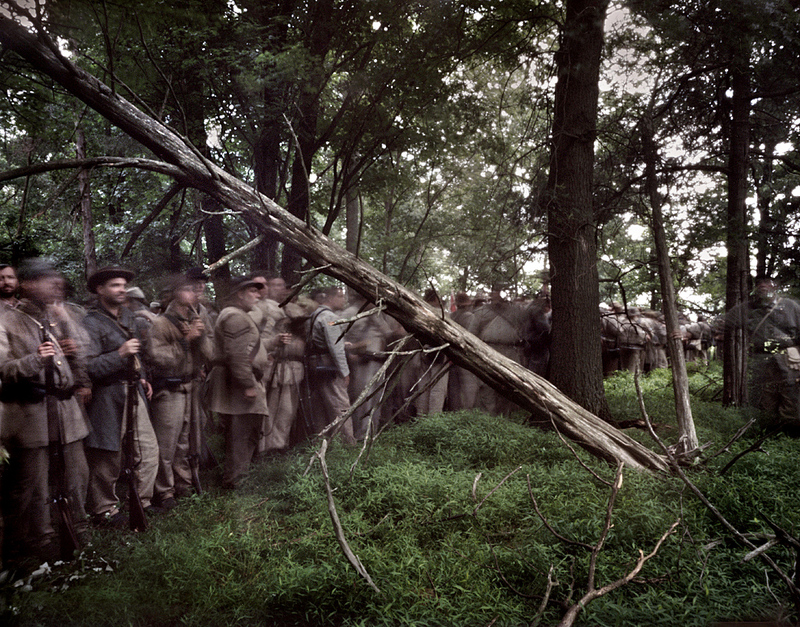 The confederates would concentrate all their power on the Union position on Cemetery Ridge, most specifically, the copse of trees at it’s center. 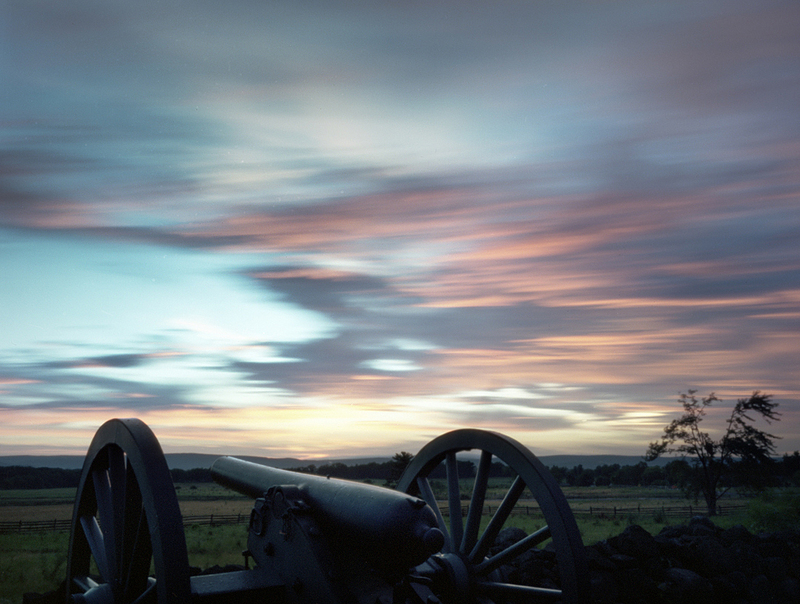 Gen. Lee would begin this final assault at Gettysburg with an immense cannonade, the largest ever heard on the North American continent. 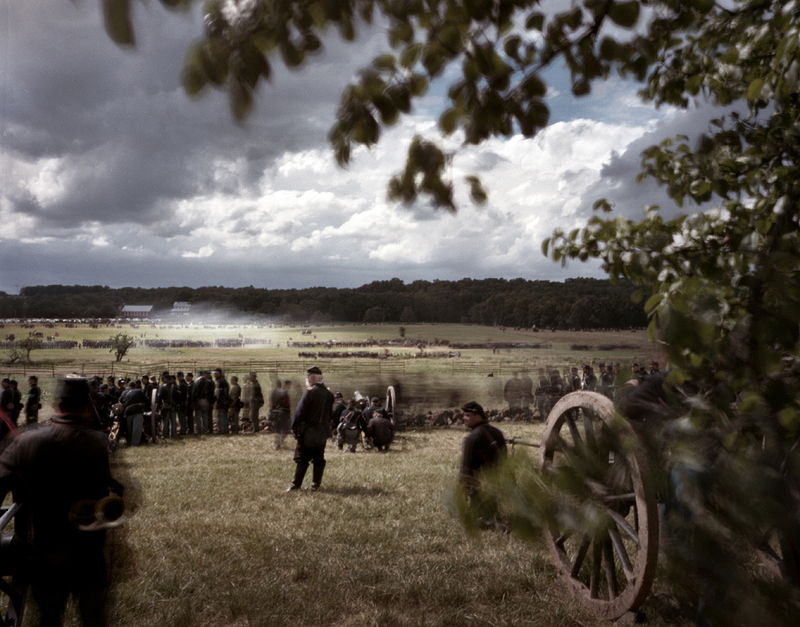 In 2013 I had the fortune, in attending two different large scale Gettysburg reenactments, the ability to view this famous Confederate attack from “both sides” of the battle. 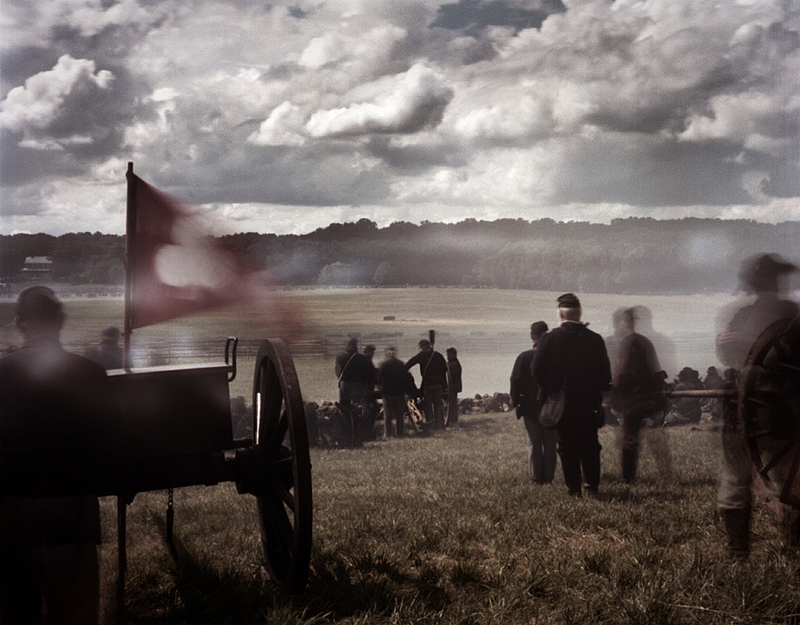 At both sesquicentennial reenactments the feeling in the air on the morning of this planned battle scenario was charged with expectation and emotion. I marched with these rebel campaigners, as thousands of Confederate reenactors began to gather and array for 150th anniversary of Pickett’s Charge. 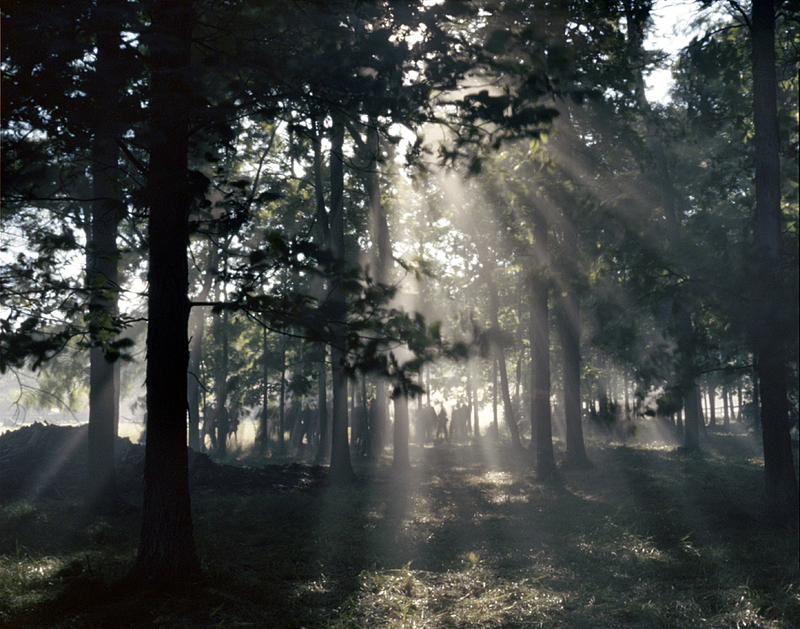 The rebel infantry began to deploy in a beautiful forest glade on the Bushey Farm. 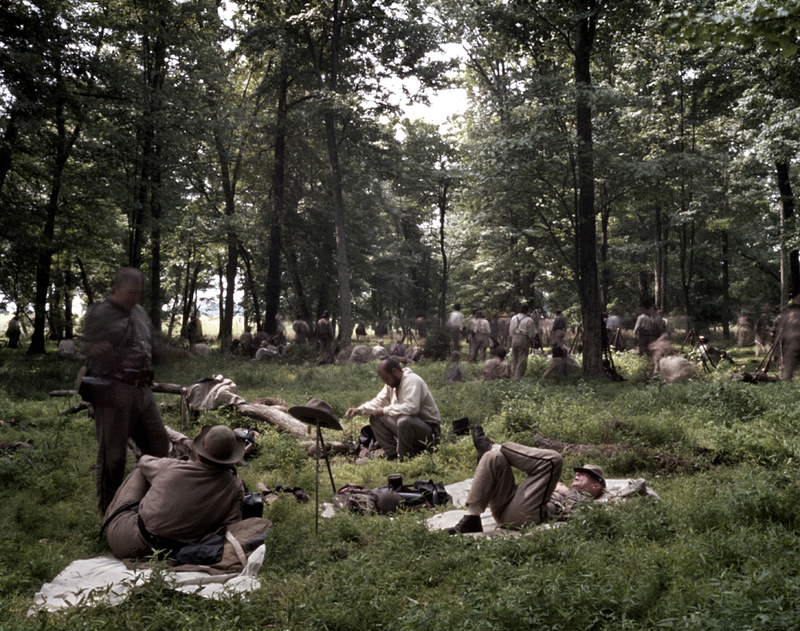 The forest now crowded here and there with groups of CSA troops, rifles stacked, having their last bite to eat or taking a last minute nap. I noticed a group of reenactors displaying their battle flag; the still controversial,”stars and bars” battle flag of the Confederacy. I walked over and fortunately got to witness a remarkable sesquicentennial event. 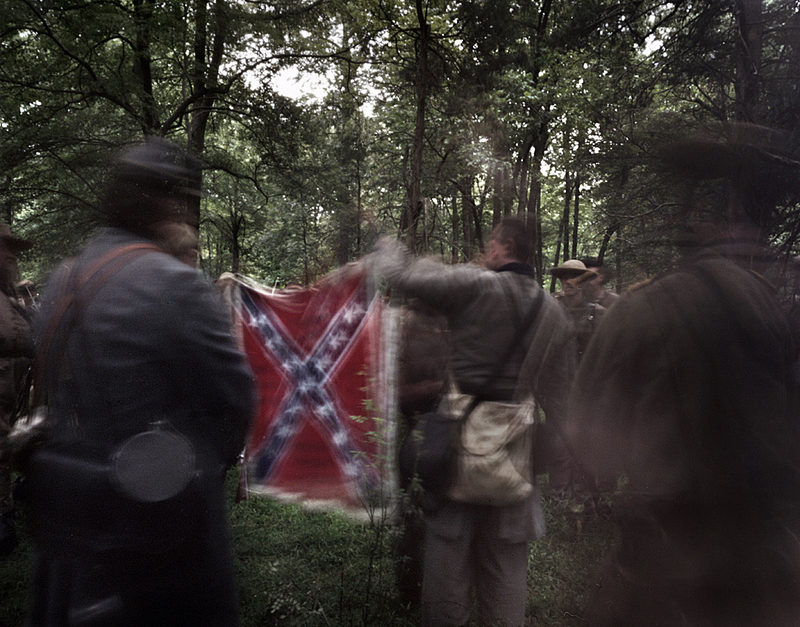 The reenactors were from Tennessee, in the impression of the 14th Tennessee regiment, CSA. The master sergeant of this outfit, the most grizzled, authentic, looking rebel I ever laid my eyes on, is in the midst of attaching this battle flag to a long, rather dangerous looking, pike. The commanding officer of the 14th Tennessee addressed his troops commenting on the flag, the words 2nd Manassas, Sharpsburg, and Chancellorsville, sewn into the battle ensign. How the honor of all the men killed defending this flag in past battles were with them on this day. The officer then, speaking to the men in the 21st century, mentions that the flag bearer of the regiment today is the great, great, grandson of the original flag bearer of the 14th Tennessee, wounded at Gettysburg in 1863. He continued that the great great grandson of the soldier that picked up the flag, after the original bearer was wounded, was with the regiment today as well. Both of these reenactors would be performing the task their ancestors had carried out with the 14th Tennessee 150 years earlier. 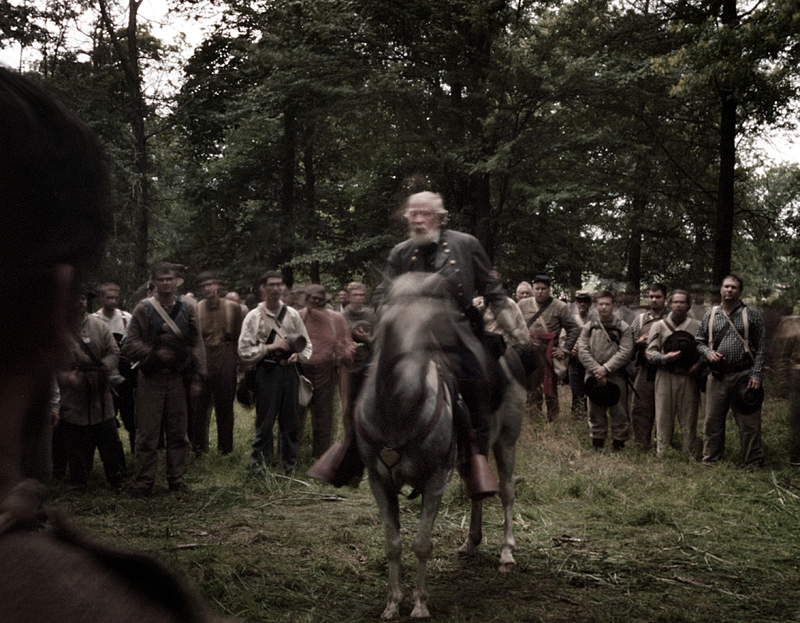 The reenactors hush as Lee rides into their midsts stopping to give a few last encouraging words before the battle. 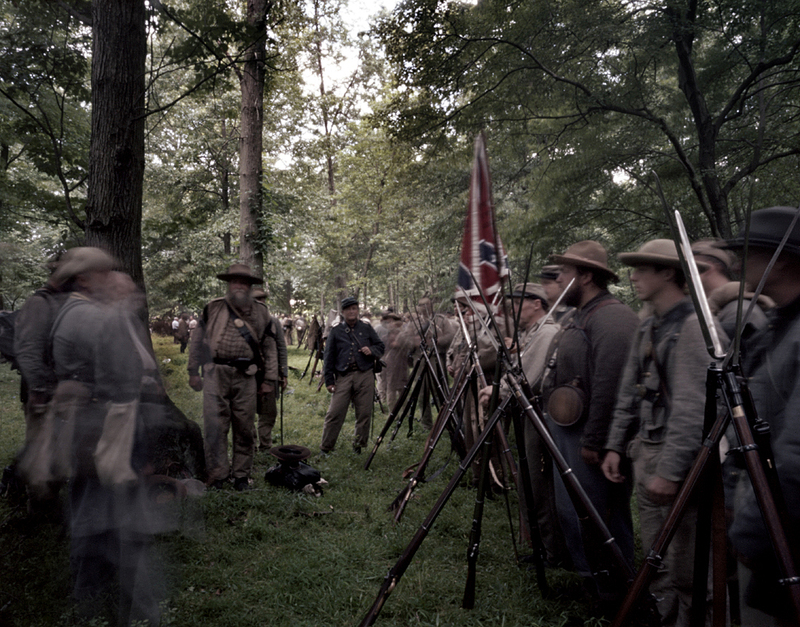 As General Lee rides off into the 21st century, the troops go wild – the reenactors looking at each other like they had just seen a ghost…. I eventually marched out with these troops and participated in this 150th anniversary of Pickett’s Charge attacking with the Confederate reenactors toward their destiny at Cemetery Ridge on the Bushey Farm. The experience was mind-numbing in a way, loud, confusing, and desperate as I fought the urge to photograph everything. 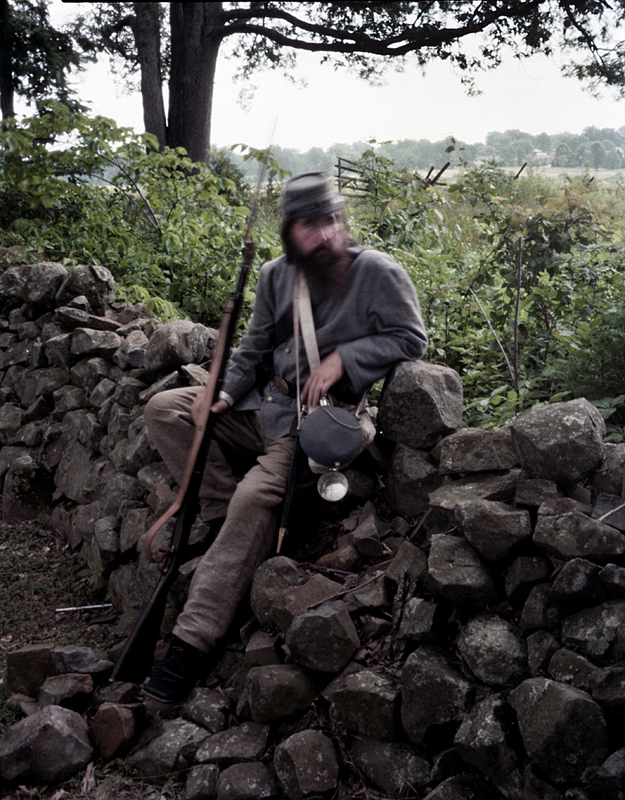 With only a few frames of film left I made an effort to reach the rock wall at Cemetery Ridge. I finally fell there, at the rock wall, literally in the shade of a copse of trees, and took my last image from this perspective. The tremendous cannonade which started the attack on July 3rd. 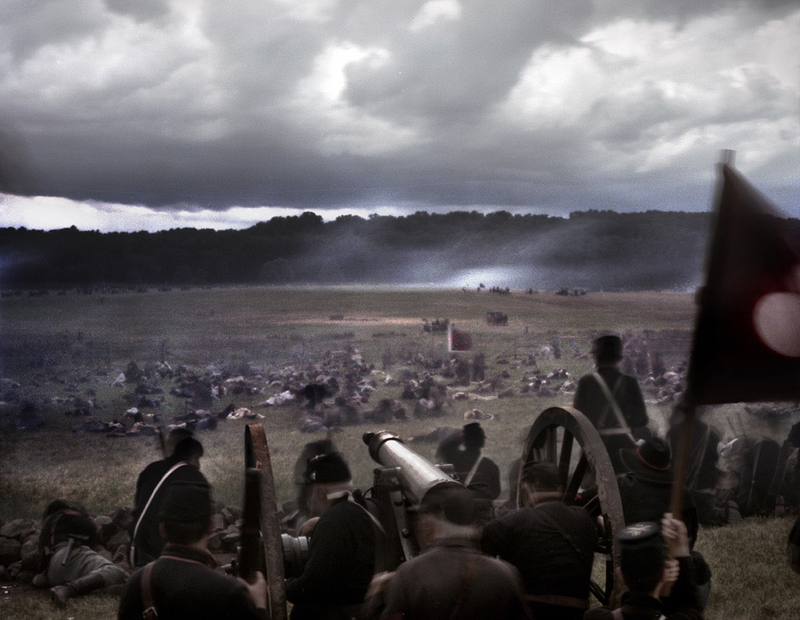 1863, nearly 300 pieces of artillery, of varying size and calibers, of both armies, all firing seemingly at once; a thunderous. mind-numbing bombardment – shells exploding and flying steel cannon balls raining down nearly every second, continuously, for two hours. 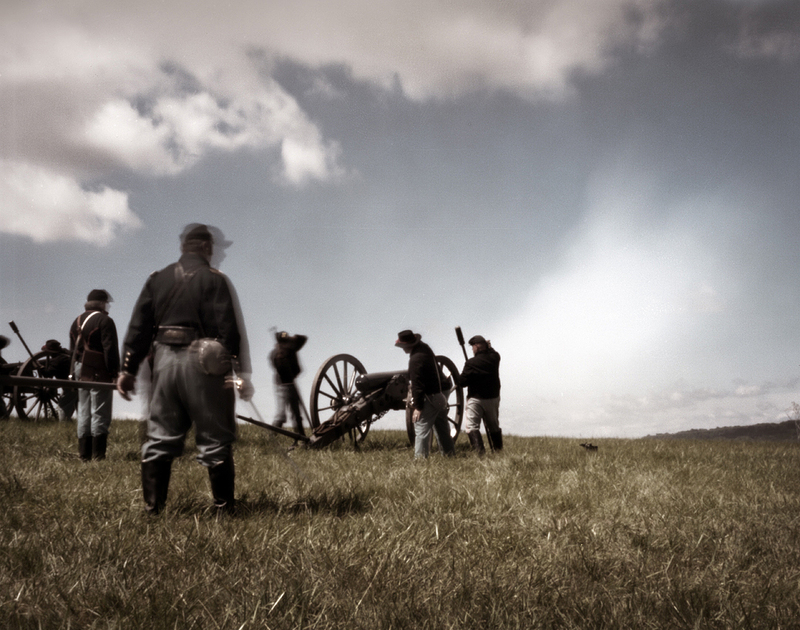 Union soldiers in the ranks made predictions about what the bombardment meant. Many guessed that the onslaught could only mean that the Confederates were retreating, the cannonade cover for their exit. But when the barrage finally ended, as the smoke cleared, every soldier in the Union army could see, out over the slopping valley, a vast sea of Rebels emerging from the woods and beginning to form up for the attack. 12,500 veteran Confederate troops, from nearly every state in the Confederacy, deployed themselves in a battle line reaching a mile in length. Colonel Haskell, on hearing of the infantry assault, mounts up and heads to Cemetery Hill. “We sprang into our saddles, a score of bounds brought us upon the all seeing crest. To say that men grew pale and held their breath at what we and they there saw, would not be true. Might not six thousand men be brave and without shade of fear, and yet, before a hostile eighteen thousand, armed, and not five minutes’ march away, turn ashy white? None on that crest now need be told that the enemy is advancing”. There was no Rebel Yell that day in 1863 as the confederate troops made their way across that deadly field. It was as if each man in the ranks had taken an account of what lay ahead and were holding their breath for what seemed an impossible task. 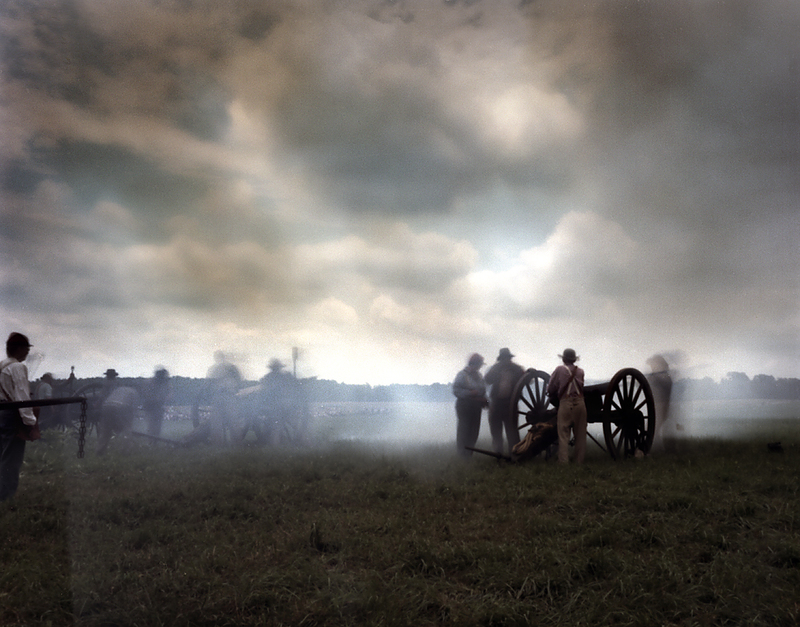 As the confederate troops stepped off for the attack Union guns open up and began hammering the advancing Rebels with artillery fire. 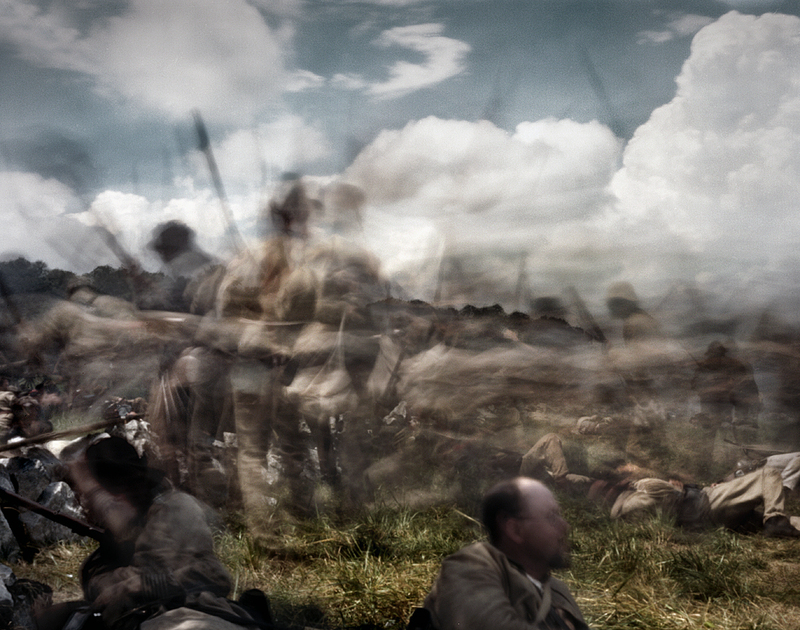 My perspective during the Gettysburg Anniversary Committee (GAC) reenactment in July 2013 changed to the Federal side in my second take at Pickett’s Charge. Earlier in the morning committee members awarded commemorative medals to veteran reenactors who had attended the 100th anniversary reenactment of the famous battle in 1963. Reenacting for over 50 years these old soldiers would be making their last charge on this day. My preferred position for the approaching battle, because of the thousands of spectators, was a small clump of trees on the hill serving as Cemetery Ridge, looking out toward the Confederate attack. The clump of trees would give me shelter, keep me out of the fray, and give me an unimpeded view to the Angle in the stone wall at my right, where the height of the fighting would occur. What happens next is a reenactment of the slaughter of the Army of Northern Virginia on July 3rd. 1863. 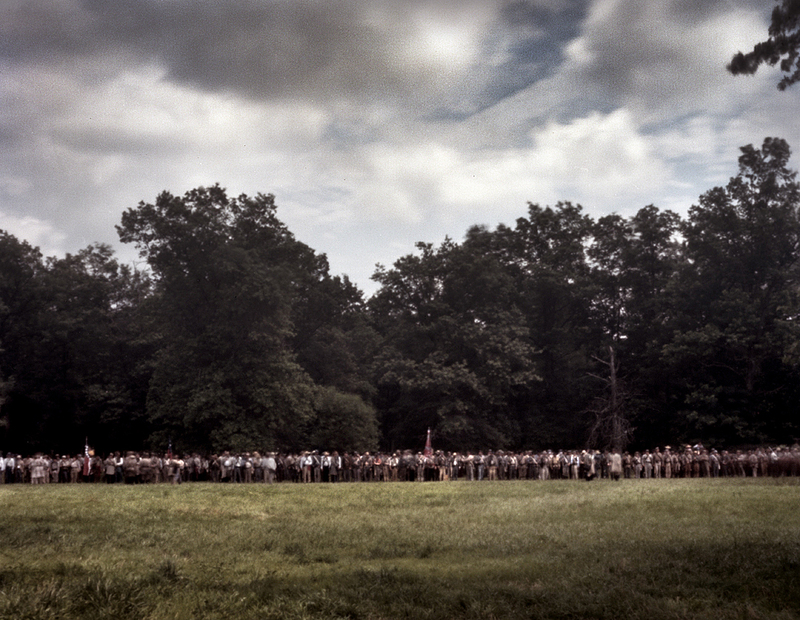 Rebel reenactors charge “unprotected” across a wide field and up the slope of “Cemetery Ridge” to the waiting troops in blue. 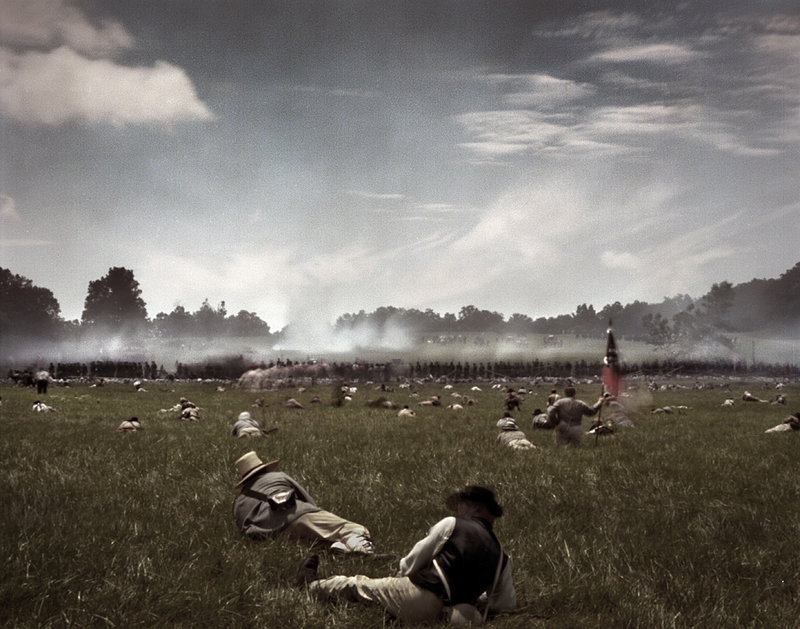 As Union troops open fire hundreds of confederate reenactors fall “dead and wounded” in the drama. By the end, the long rock wall at “Cemetery Ridge” is piled in “dead, wounded and struggling men” a grim, grey mass undulating in the smoke…..
As the fight continued Haskell writes, ” The conflict was tremendous, but I had seen no wavering in all our line.” That was until Haskell looked to his right and noticed, near the copse of trees, soldiers of Webb’s Brigade breaking ranks and falling back from the Rebel onslaught. Haskell sprints on horseback to the copse of trees, sword in hand, and stops the withdrawal by appealing to the soldiers’ patriotism and a little help from the back of his sword. The fighting here at the copse of trees and the angle in the wall becomes desperate with soldiers using clubbed muskets and the bayonet. The fighting was extremely close, the two armies now just a few feet apart, separated by the low stone wall. 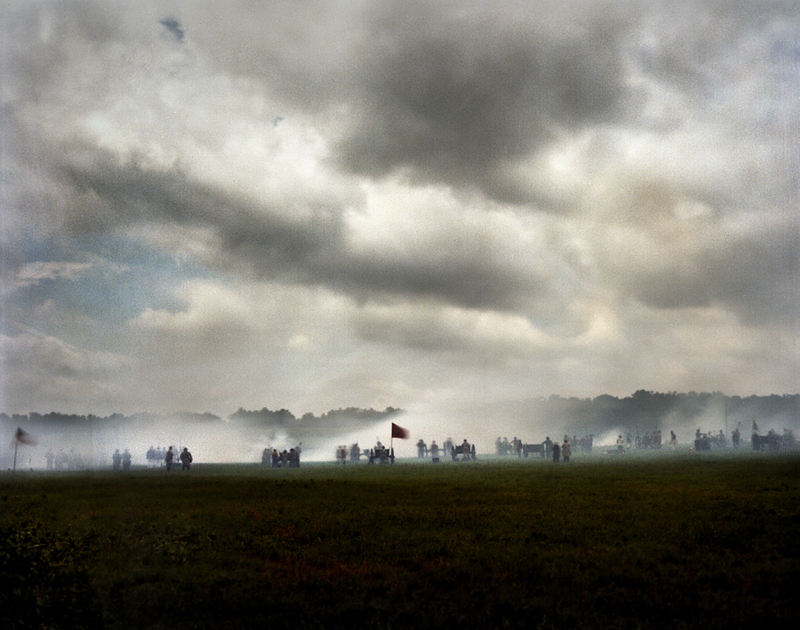 The next day, July 4th 1863 it rained at Gettysburg. The armies continued to face each other across that now hallowed ground but the contest was over. 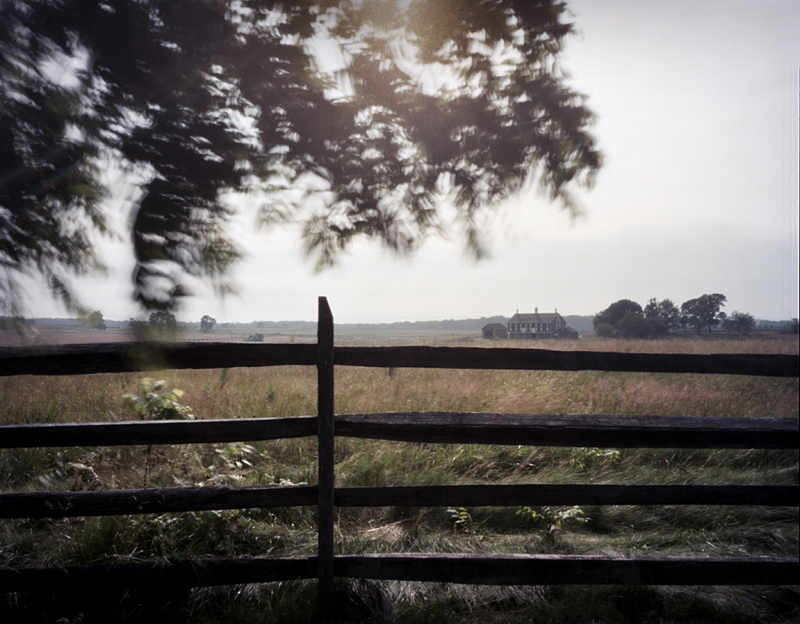 General Lee and the Confederate army began their withdrawal back to Virginia that evening. The Battle of Gettysburg was over. 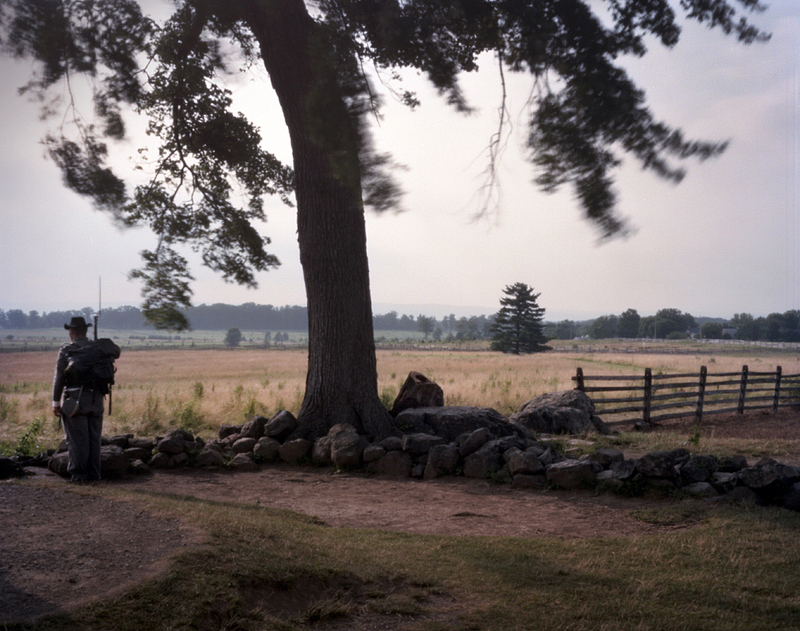 Haskell, recovering from a bullet wound revisits the battlefield on July 6th, just two days after the conflict. Haskell visiting the battlefield just a couple of days after the fighting dictates that much of the evidence of the fighting was gone just a few days after the battle. 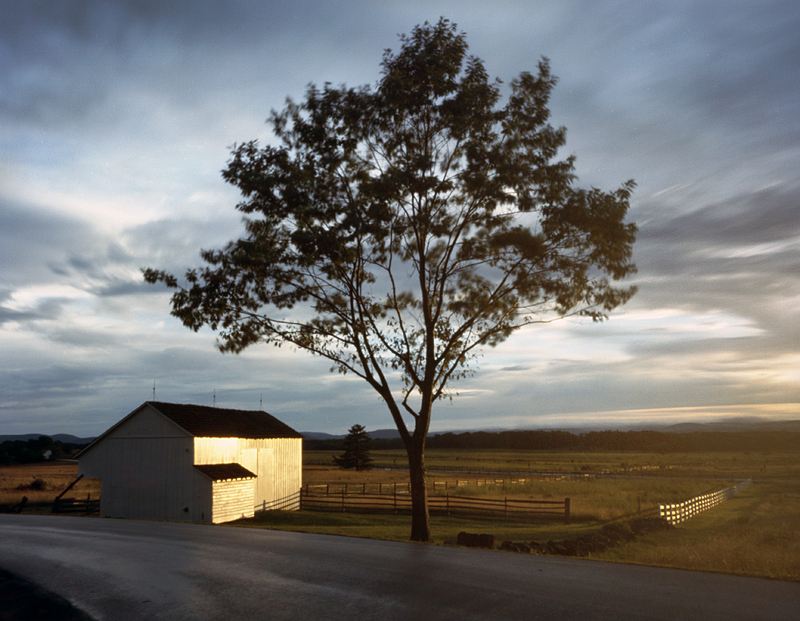 The rains of July 4th, 1863, washed the blood from the fields around Gettysburg and the small Pennsylvania town inexplicably went back to being the sleepy, quiet, crossroads it had been before July 1863. Mike, as always, your work gives me chills….these are so compelling and evocative….great work!! thanks Trish you and my Mom are my biggest fans! your photos in a documentary Im currently working on? 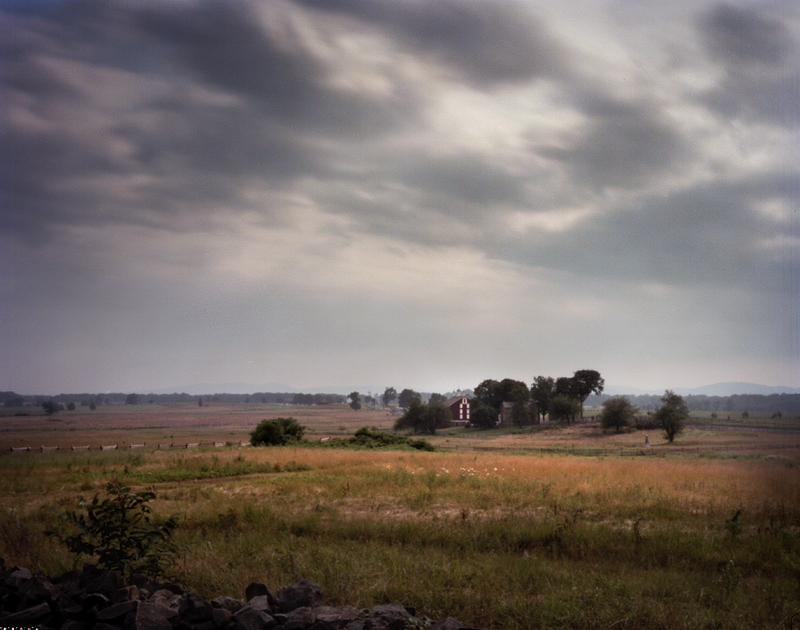 I am doing a project on Gettysburg. I would love to use your images. Is that possible? Hello thanks for your interest in this work. Please tell me more about your project. The images on my blog have been published in a new book called “Echoes of the Civil War” available at all major book stores etc. please tell me more about what you’re working on exactly.